Pavant and Canyon Ranges, Utah. Research Day 6 (July 15). 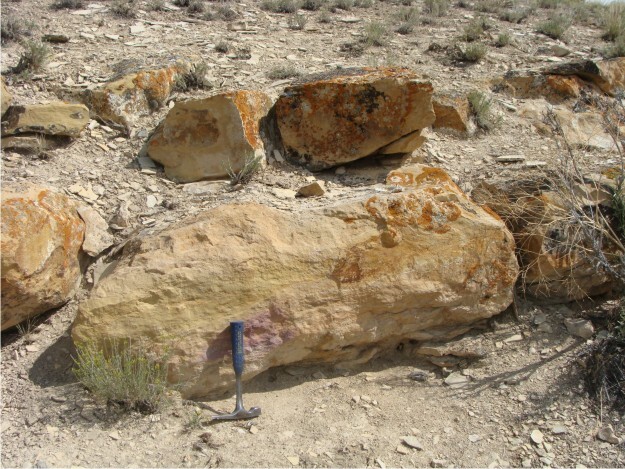 The old slogan for geologists is that the best geologists are the ones who have seen the most rocks. 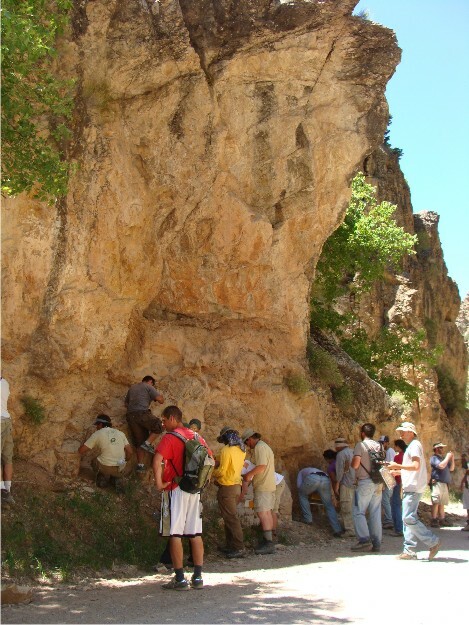 So, today, instead of spending time in the Green River Formation, we joined Ohio State’s field camp on their yearly visit to the Pavant and Canyon Ranges. Because of my affiliation with OSU’s field camp through the years (this year I helped teach the first half of field camp), the Wooster Crew stayed in the same apartment complex in Ephraim as the OSU crowd. Each day, we were able to interact with other professors, TAs, and students. 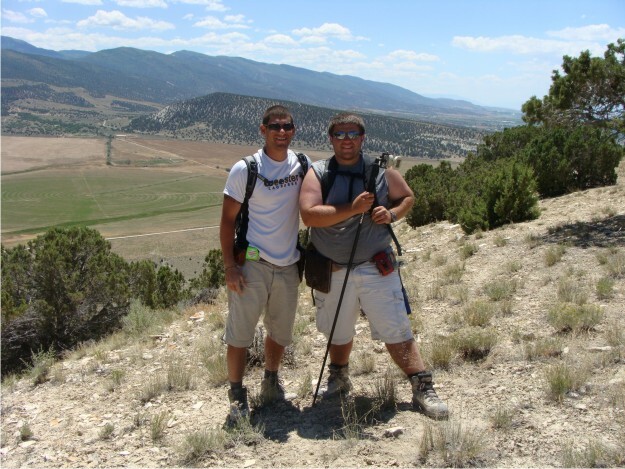 So, when we found out the day of their Pavant and Canyon Range trip, we decided to tag along. 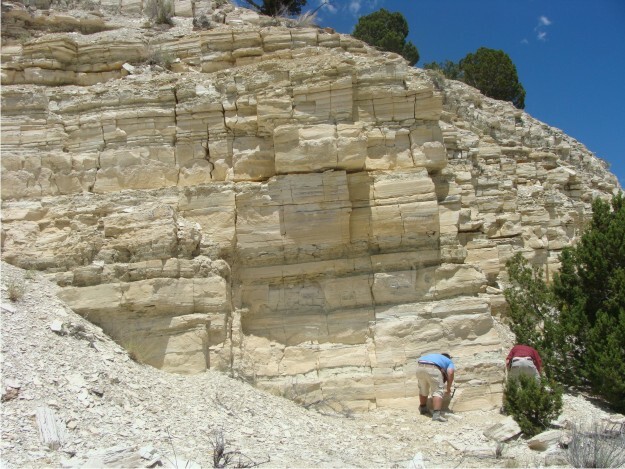 For their Junior I.S., both Phil and Bill read literature on the Sevier Orogeny in Utah, and today’s visit to these ranges enabled us to first-hand witness some of the figures published in this literature that we had read earlier in the spring. 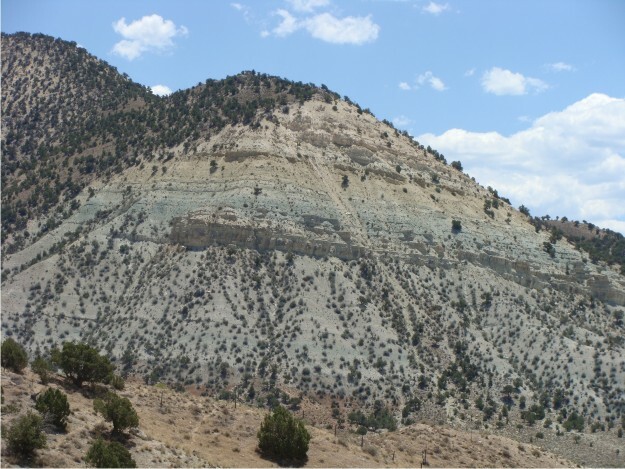 The Pavant Range and the Canyon Range expose some of the large thrust sheets associated with the Sevier Orogeny, along with some additional small-scale faulting and folding due to the regional compression. We welcomed the trip to the Pavant Range. 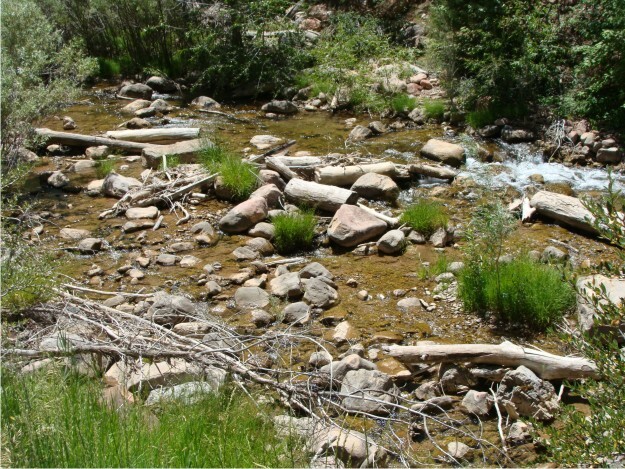 The photo above is a typical stream dissecting the canyon where the Pavant Thrust is exposed. Temperatures in the Canyon were slightly cooler than what we had grown accustomed to back in Ephraim, where we had been working in 99 F temps for the past few days. Everyone was tempted to wade in these cool streams during our lunch break. 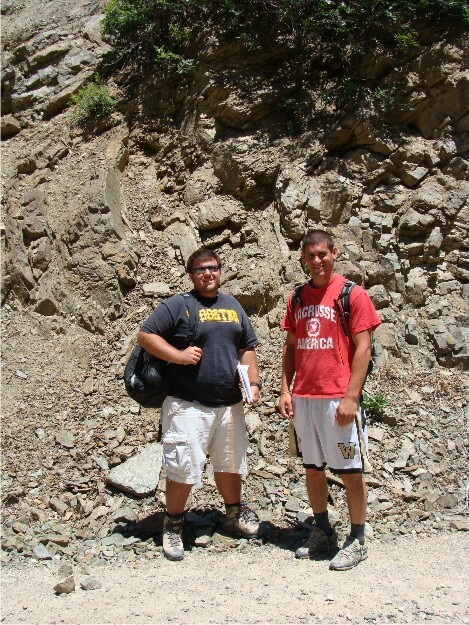 Bill and Phil are posing in front of one of the small folds in phyllites associated with compression events in the Pavant Range. 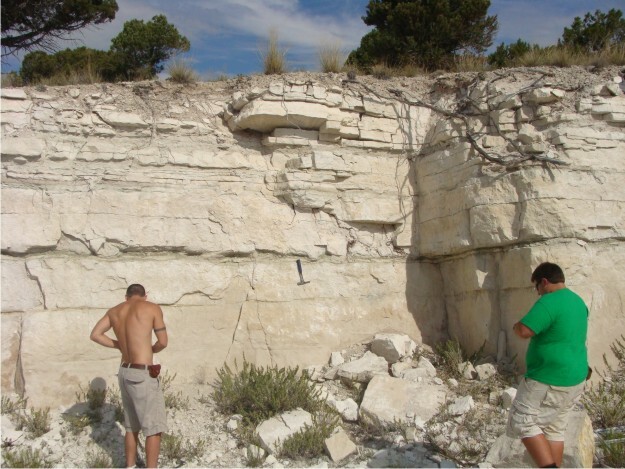 The Wooster and OSU gang looks at some of the rocks exposed in the Pavant Range. 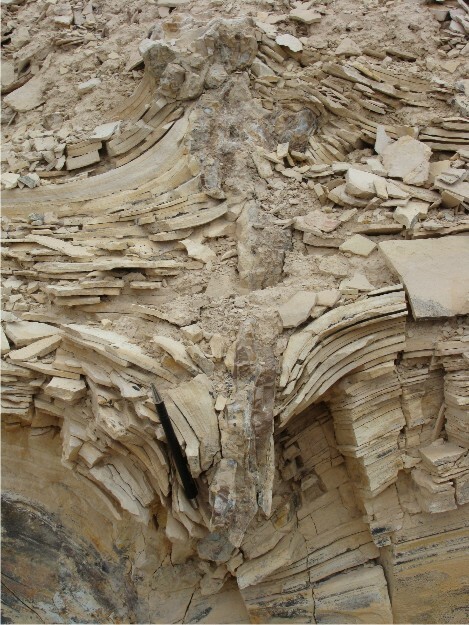 This is another spectacular fold in the Pavant Range that shows several folding generations. 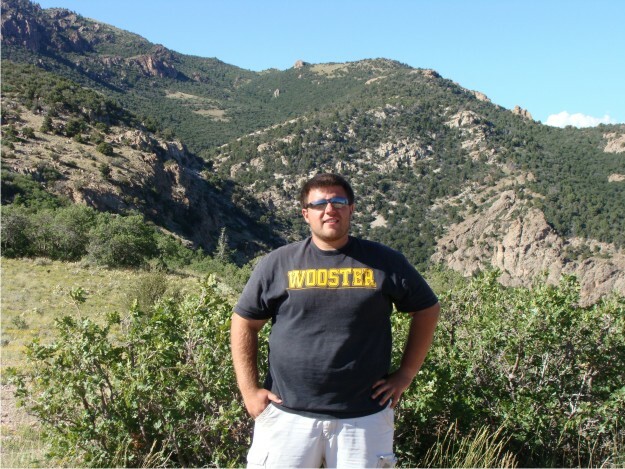 Wooster makes it to the Canyon Range Thrust overlook! 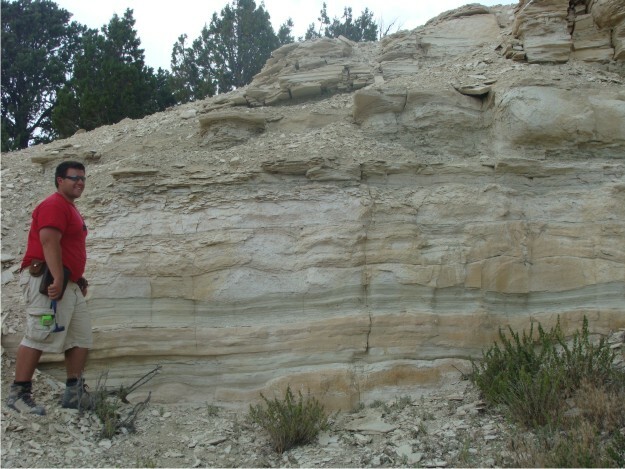 Behind Bill is the famous exposure of the Canyon Range Thrust, where synorogenic conglomerates were deposited at the front of the thrust sheet. 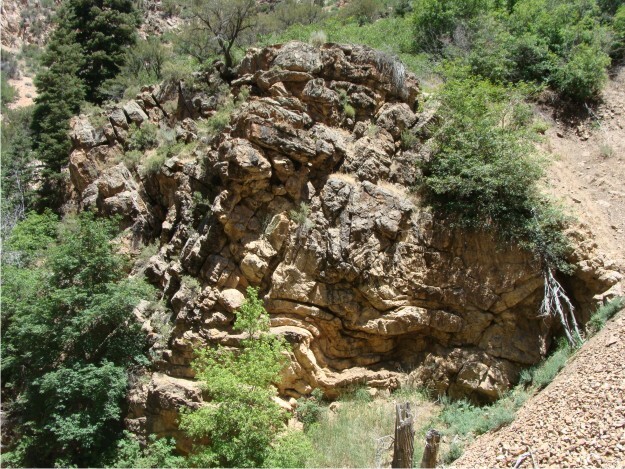 The exposure is located in Oak Creek Canyon in the Canyon Range. 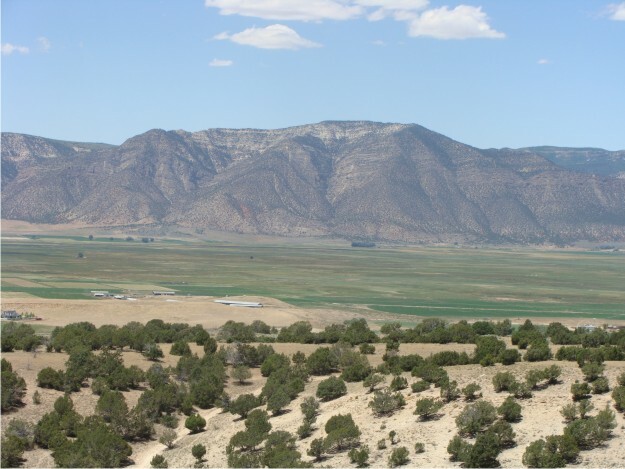 White Hill, north of Ephraim, Utah. Research Day 5 (July 14). 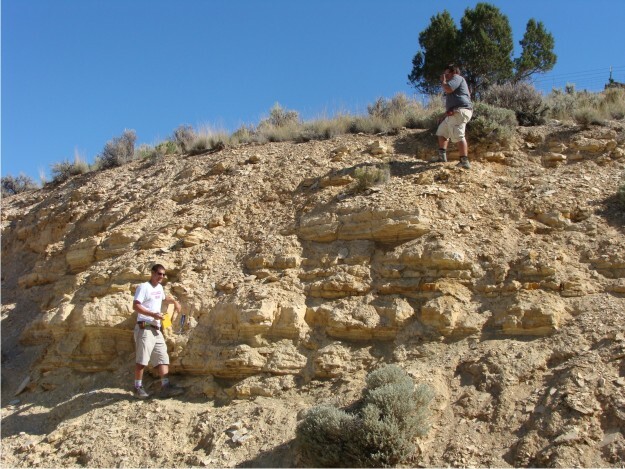 We devoted most of today to mapping the largest and most continuous tuff in the Green River Formation. 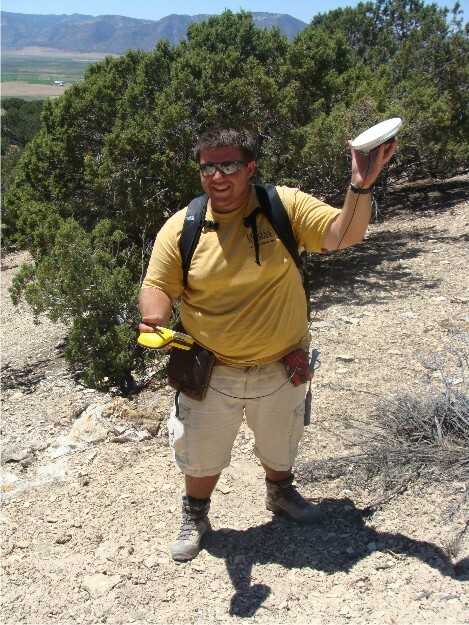 Our goal was to walk completely around White Hill while mapping the tuff with a Trimble GeoXH Handheld. 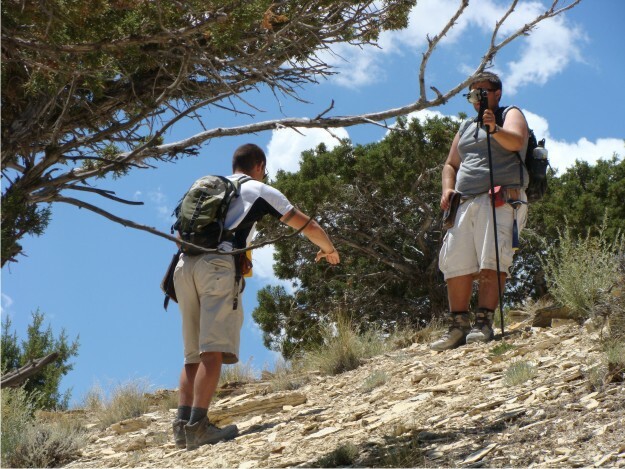 This was part of Bill’s project, so he was in charge of GPS data collecting, while Phil was the “point man” (i.e., he walked ahead of Bill, all the while trying to keep on top of the tuff even when it was in nearly covered intervals). Bill used an antennae with the handheld GPS; however, the only catch to our plan was that we did not have an antennae rod. So, Bill walked around White Hill with GPS and stylus in one hand and the antennae in the other, striking a pose like the Statue of Liberty. This enabled us to get sub-2 ft resolution, which is good data for his mapping project. We started mapping the tuff at road level (~5,620 ft elevation) and ended the day at the top of White Hill (~6,381 ft elevation). Due to the dip of the beds, it was a slow, steady climb throughout the day. However, the view at the top of White Hill is gorgeous. 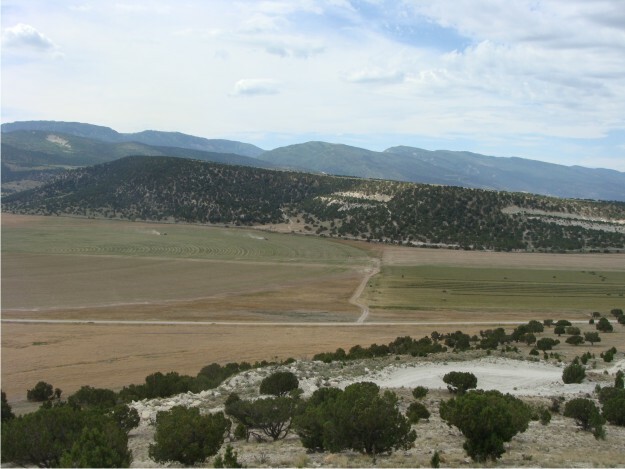 For example, the photo above is a view to the W of the Gunnison Plateau (San Pitch Mountains). On a clear day in central Utah, you can see for miles. 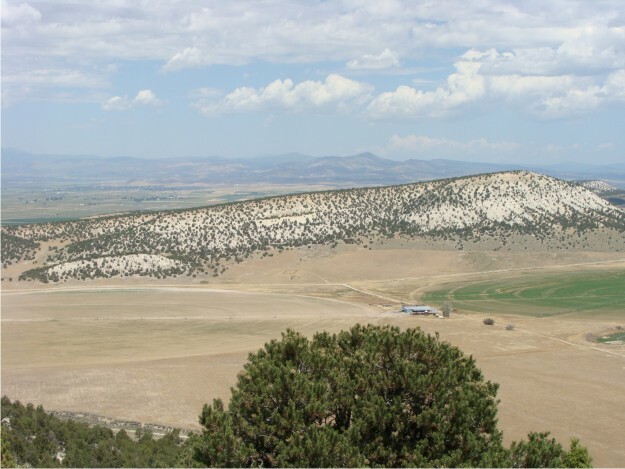 White Hill, north of Ephraim, Utah. Research Days 3-4 (July 12-13). 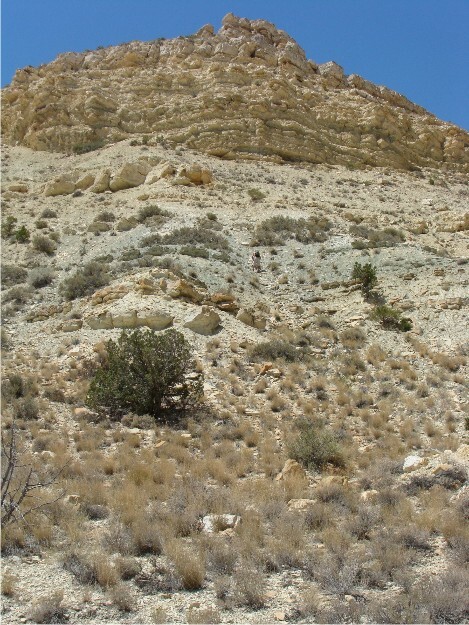 In the Green River Formation exposed in the Sanpete Valley, there are numerous large and small quarries that provide excellent exposures of the unit. 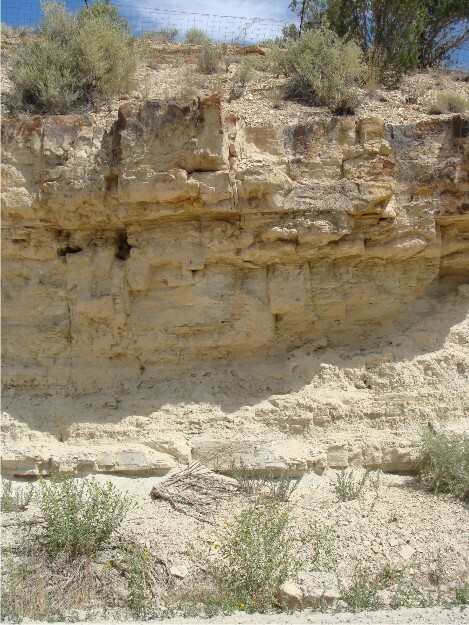 In some places, the Green River contains massive bedding — perfect as quarry stone for buildings in the area. 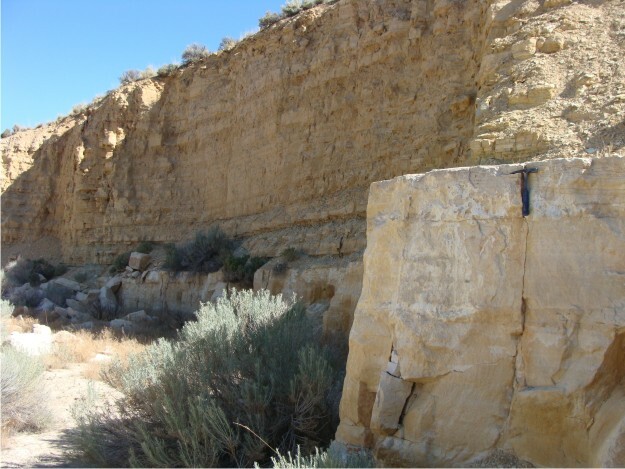 Over the course of these next few days, we measured a 175 ft stratigraphic section through the Upper Member of the Green River Formation in one quarry, but then moved on to measure additional stratigraphic sections through three additional quarries. By the end of the two days, Phil and Bill were becoming experts at measuring sections. 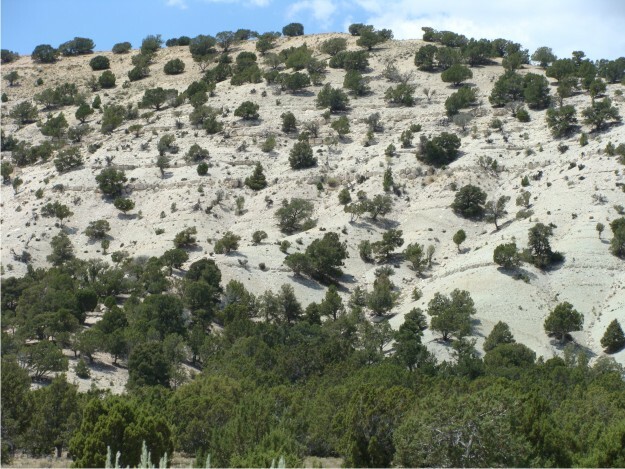 Here is a scenic view of a portion of White Hill that contains two quarries. 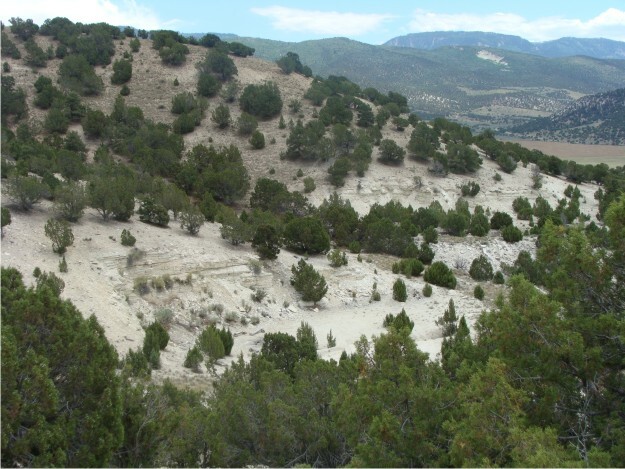 These quarries, although small, provided evidence of the shoreline of the Green River lake in this area. 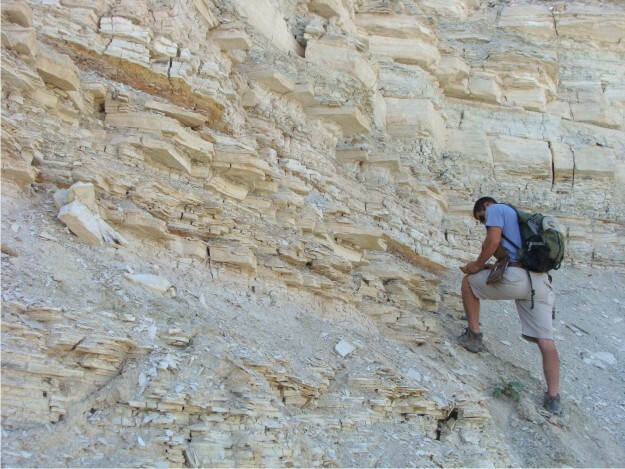 Bill is at the edge of one of the small quarries, trying to find both stromatolite beds and mudcracks within the Green River. 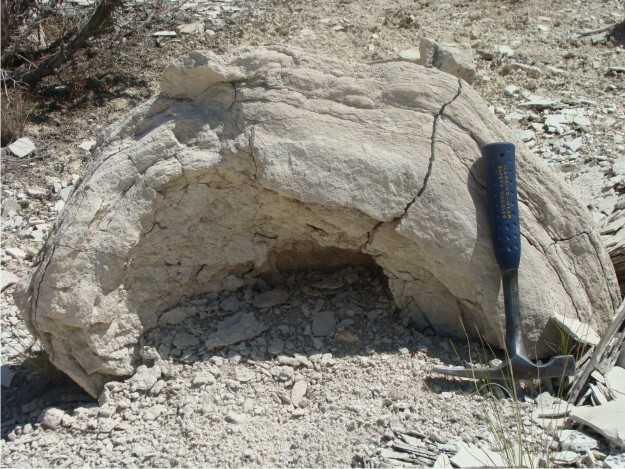 Some of the stromatolites in the Green River are only a few inches in height; others -- like the one pictured above -- are quite large and easier to recognize. 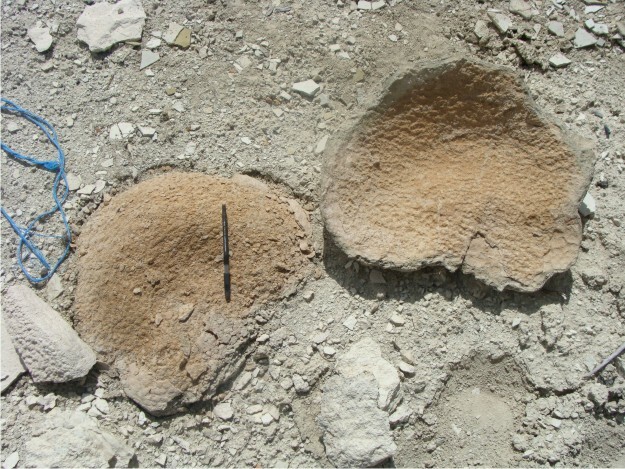 View of the top of one of the larger stromatolites (pencil for scale). 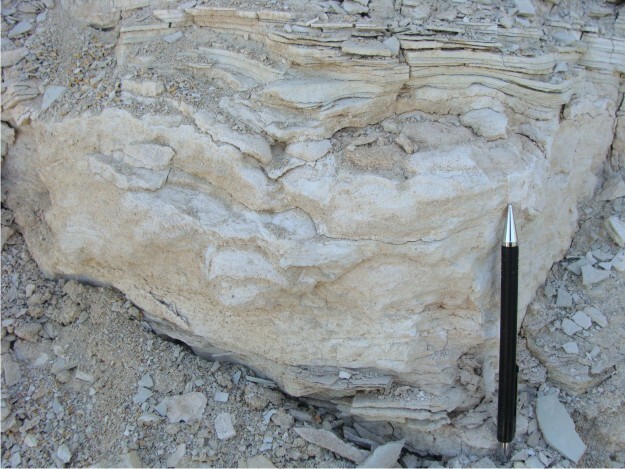 For some of the loose stromatolites, we could actually peal back the individual layers to see the textural features. View of the underside of the elusive mudcracks that we tried to find in situ. 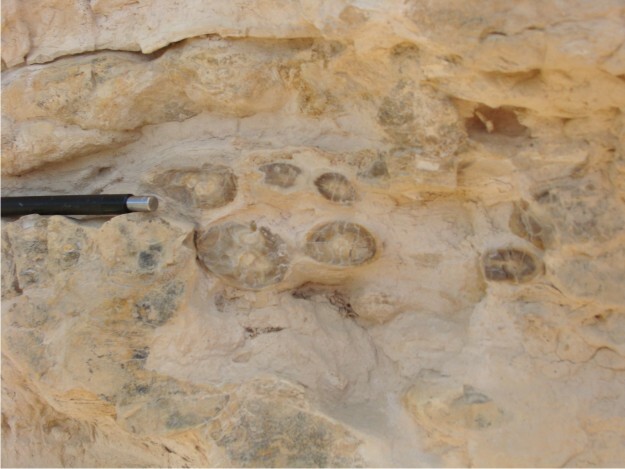 Mudcracked slabs were abundant as float, but they proved to be difficult to find in place due to the platy bedding in the quarries. Here's a view of one of the larger quarries on White Hill. Bill and Phil are in the photo for scale. 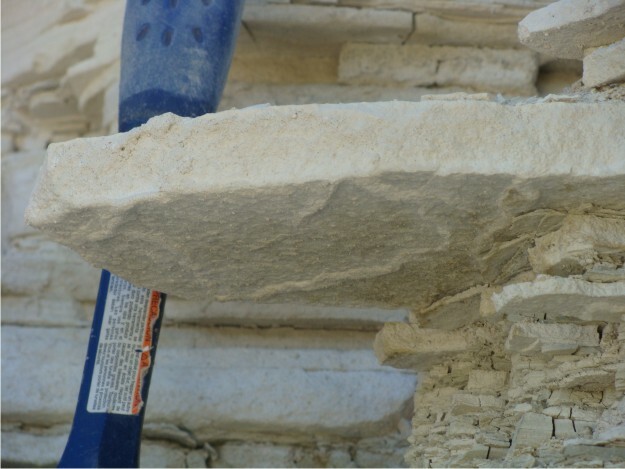 The guys are busy trying to "mine out" a thin green tuff bed within the limestones of the Green River. As Phil put it, finding this green tuff was "money", because it will help us correlate this quarry to other stratigraphic sections in the area. 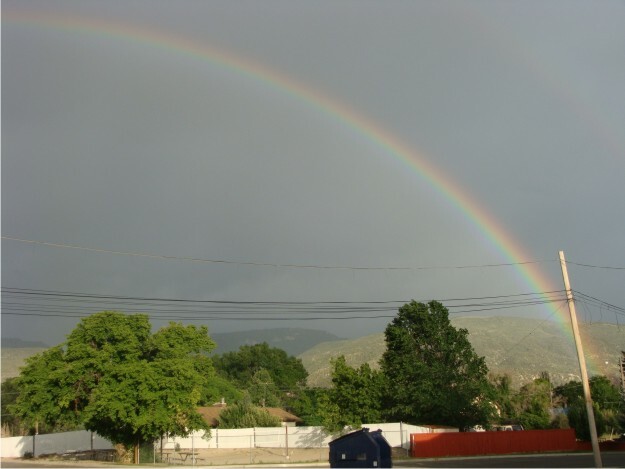 We ended the days working in the quarries with a beautiful double rainbow back at the Ephraim apartments in the evening, shortly after dinner. Kelly and Colin standing on one of the lower ridges near Excursion Ridge. Today we hiked up Excursion Ridge to collect yellow-cedar samples for Colin’s I.S. On the trek up to the cedar stand, we hiked up the road and passed the dam used for the Falls Creek hydroelectric project. They plan to harness the power of Falls Creek to provide summer power to Gustavus. The dam on Falls Creek. They regulate the flow of the creek to provide power while still allowing enough water for the fish. It is a controversial project due to questions on power provided versus environmental impact. The day was uncharacteristically beautiful, and the expedition turned out to be fruitful. 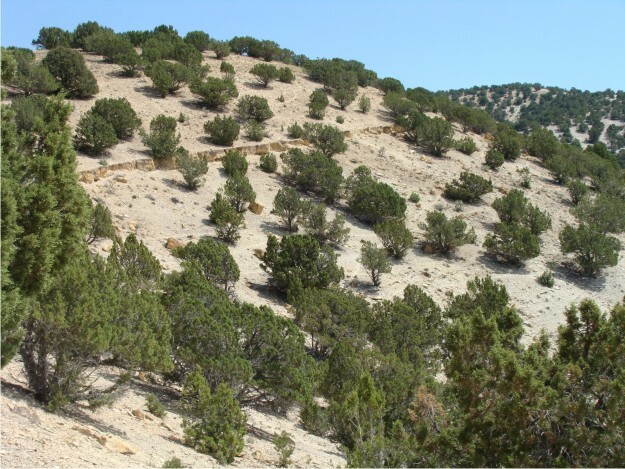 We collected samples from 43 yellow-cedars, with at least two samples from each tree. While at the site, we also collected samples from lodgepole pines dominating the meadow to satisfy our scientific curiosity. All in all a very productive day. Colin places a core into the straw after extracting it from the tree. The meadow located at the top of the sample site, dominated by lodgepole pines and covered by arctic cotton. Dr. Wiles and Kelly walk through the meadow to the lunch site. Ephraim, Utah. Research Day 2 (July 11). 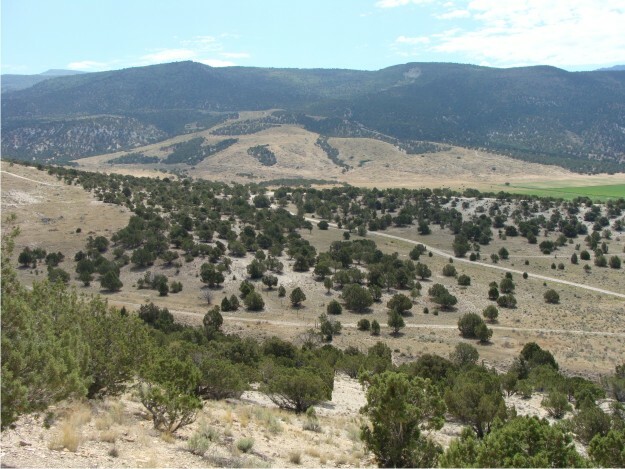 Field work began on one of the cuestas north of Ephraim, commonly called White Hill. This particular cuesta rises to a height of 6,381 ft in elevation — a good climb for our first day out in the field in the dry Utah heat. 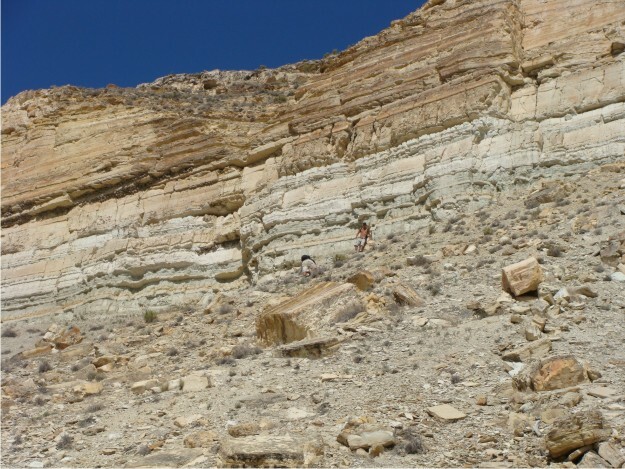 We used our first official day as a day of reconnaissance, examining several quarries located on White Hill and also examining a rather large tuff exposed around the cuesta. 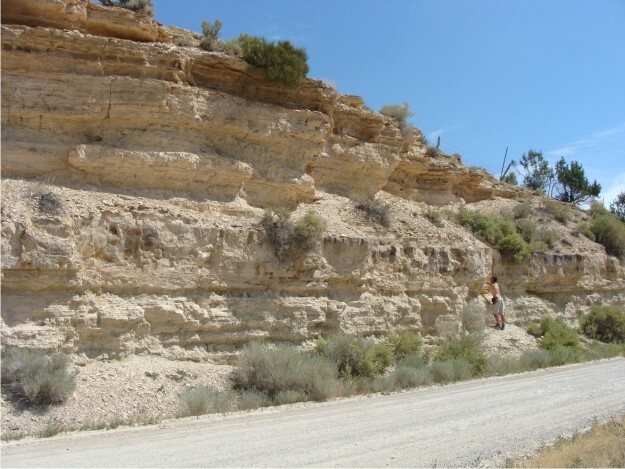 Phil is planning on conducting research primarily in the quarries in an attempt to stratigraphically correlate the Green River Formation locally, while Bill is going to research the multiple tuff beds present in the formation. 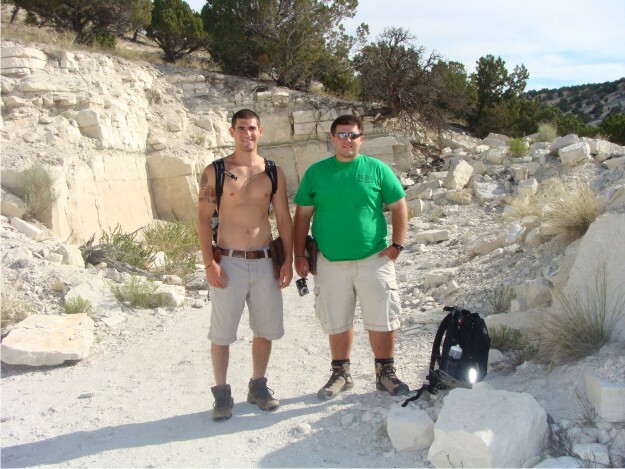 Below, Phil (left) and Bill (right) are eager to begin work in one of the quarries located on White Hill. Although only 8:00 am, the morning temperatures are in the mid-70s, but they will rise to the mid-90s by the afternoon. 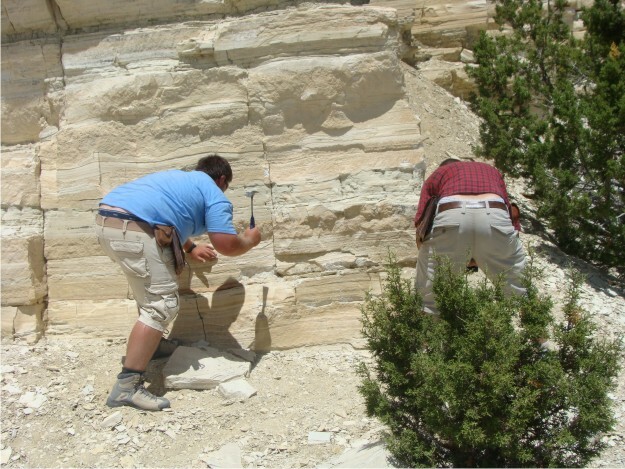 The guys are hard at work examining the various lithologies, which range from lime mudstones to boundstones and everything in between. 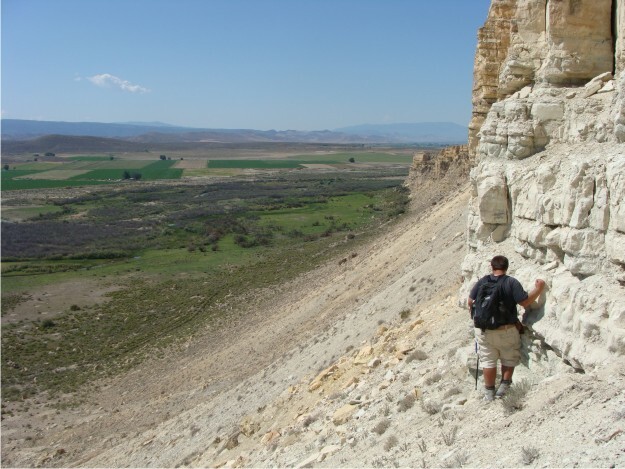 View of the largest tuff that was erupted into the Green River lake. 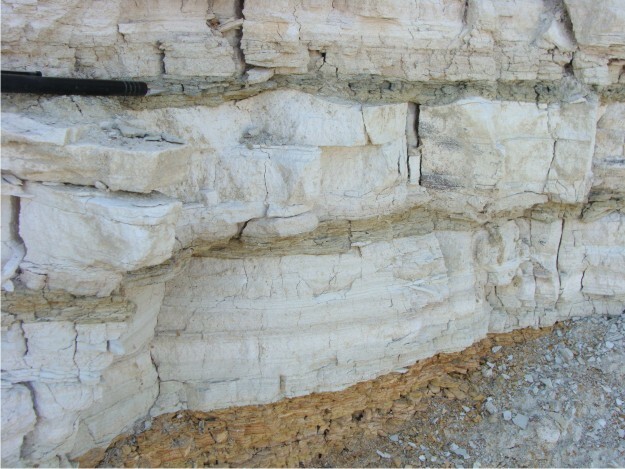 In places, the tuff is up to 4 ft thick and represents a moment in geologic time.